Learning the Alexander Technique is learning to incorporate a practice of balance, stability and presence into our everyday lives. Lessons consist of being guided through simple movement including sitting, standing, walking, and learning constructive rest lying down on a table. The teacher, with a gentle touch, helps to release habits of compression, restoring a natural poise. Sessions last between 45-50 minutes. A series of sessions is recommended in order to integrate the work into one’s life. Breathing Coordination is an essential part of the Alexander Technique and is incorporated into all of the regular Alexander lessons. However, it is possible to study this as the primary focus. 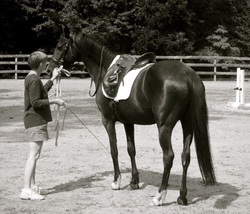 Lessons are based on the principles of Classical Riding and taught with the eye of an Alexander Teacher. From training level to Grand Prix, we all need assistance in understanding where we are working too hard and where we are not working hard enough; where we are pulling 'down and in' rather then expanding up and out; and where our intellectual understanding meets our kinesthetic understanding. Every lesson seeks to improve the balance of both horse and rider, thus improving communication, coordination and understanding. I encourage all riders to take some lessons in the Alexander Technique. Workshops/Clinics are available on request including CLASSICAL BALANCE: RIDING AND THE ALEXANDER TECHNIQUE, a workshop for horseback riders and INTRODUCTION TO THE ALEXANDER TECHNIQUE suitable for everyone!